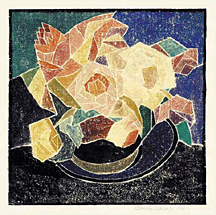 June Roses - - 1922, White Line Color Woodcut. Clarkson, block 40. Edition 3. Signed and dated in pencil. Image size 11 5/8 x 11 11/16 inches (295 x 297 mm), sheet size 18 x 15 1/4 inches (457 x 387 mm). A fine, rich impression, with fresh colors, on heavily textured handmade paper; full margins (1 3/4 to 4 inches). Pale foxing and creasing in the outside top and bottom margins from folds in the large sheet made by the artist. Inscribed in the artist's hand Blanche Lazzell, June Roses, Provincetown, Mass $30.00 on the bottom sheet edge, now reading upside down with the sheet folded flat. Numbered 105/1 in both the upper right and lower right margins, verso; and inscribed in the artist's hand Blanche Lazzell, Morgantown, West Virginia, U.S.A. in the top margin, verso. 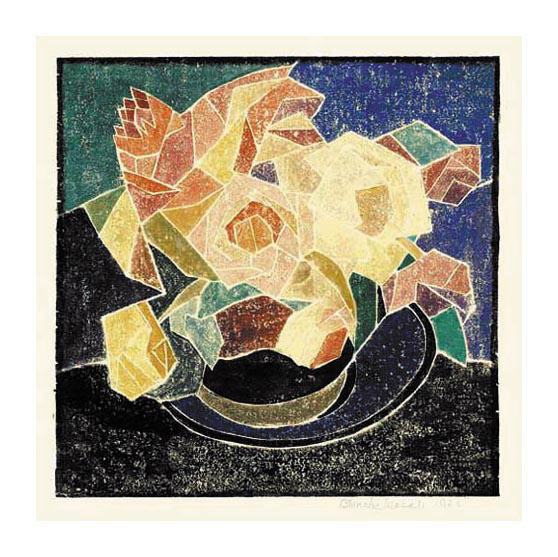 June Roses exemplifies the strong, modernist compositions and complex palettes of Lazzell's finest early work. The artist's use of heavily textured paper lends the work a rich, painterly character, enhancing its quality of pure luminous energy.